Prodrive Technologies, one of the fastest-growing technology companies in Europe, provides technology solutions, ready-to-use-products and manufacturing services in electronic, mechatronic and mechanical manufacturing. Their innovative product offering ranges from inverters and engine control units (ECU) for the automotive industry, to advanced mezzanine cards (AMC) for computing solutions, as well as solar and wind power inverters. Prodrive’s reliable manufacturing services include full in-line PCBA production, injection moulding, and robotized system assembly, just to mention a few. Since the company was founded in 1993, Prodrive has optimized their electronics production and supporting processes so that they are highly efficient and flexible with superior output quality. Prodrive can achieve this by maximizing robotics and by continuously monitoring and optimizing their processes. 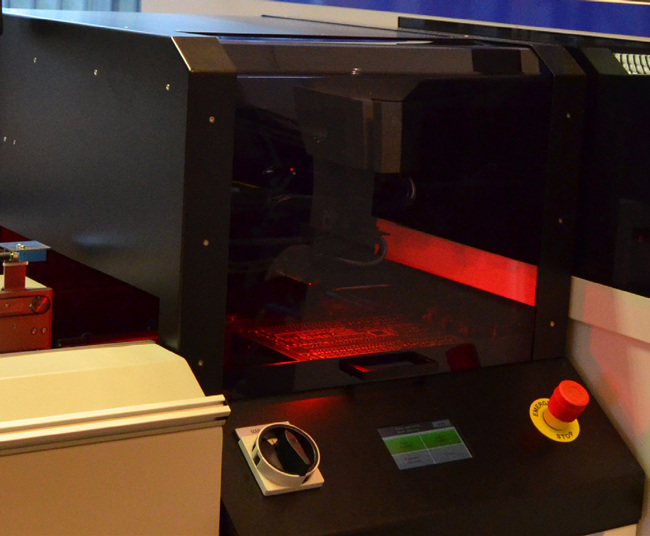 Prodrive’s state-of-the- art electronic manufacturing capabilities ensure that its customers can benefit from the latest electronics manufacturing techniques and technologies. Typical sectors that Prodrive serves are industrial, consumer, medical, automotive and military. Prodrive and its customers require that the PCBs that are manufactured and integrated are marked with two- dimensional (2D) Data Matrix codes. The codes are laser etched directly onto the PCBs during the manufacturing process. In order to improve production yield, quality and traceability at each step, Prodrive decided to develop a scan conveyor, which would include a small but powerful direct part mark (DPM) barcode reader. This scan conveyor would be integrated in their board handlers, as a connection between the different stages of the PCB manufacturing process. The DPM barcode reader had to be able to decode a range of codes with varying code and background colours. In addition, Prodrive needed to ensure sufficient illumination, which is crucial for acquiring a good quality image. Prodrive developed a scan conveyor with the MS-2D imaging engine from Microscan for DPM barcode decoding. After an extensive vendor selection process, Prodrive opted for the ultra-compact MS-2D barcode imaging engine from Microscan for the scan conveyor. The main selection criteria included easy integration, compact size, focal distance, interface type, and most importantly, code reading performance. The MS-2D engine can be easily integrated into any device. Featuring advanced technologies for decoding, the MS-2D engine includes a dual optical field for reliable reading of both large 1D barcodes and high density 2D symbols. Designed specifically for embedded applications, the MS-2D engine provides the best performance available for reading 1D/2D symbols and direct part marks at very close range. 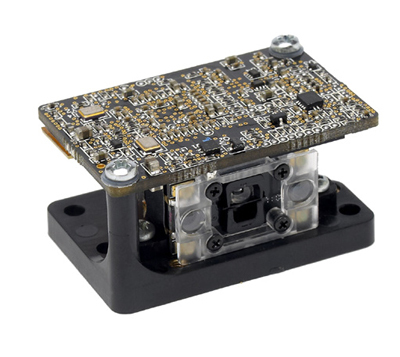 The MS-2D decode board has a footprint of just 39.0 mm x 24.9 mm x 7.6 mm, and weighs only 2.8 g.
“We have over a thousand different products going over the same line per year, which is why we needed a new solution that could provide an improved scan yield and a higher degree of flexibility. The feature that really set the MS-2D imaging engine apart was its ability to read high density barcodes, in combination with the easy integration and suitable price,” Sam de Bruijn, Sales Manager at Prodrive explains. 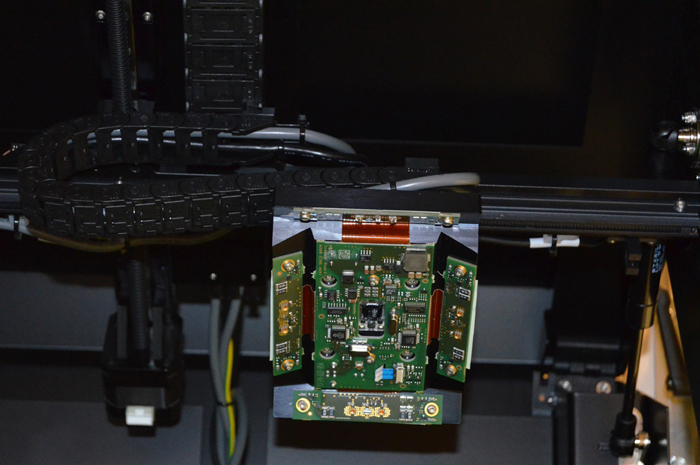 Prodrive designed a solution where the MS-2D imaging engine is integrated into an XY positioner above a conveyor, inside an opaque cabinet. This allows it to acquire the best possible image of the code for decoding. “The new solution is much more flexible and cost-effective than the static barcode readers we have used in the past, where we experienced some issues with occultation and ambient light," Sam de Bruijn explains. Prodrive developed software to communicate the read results to the next machine and the server. If a problem occurs, an error message is shown on the display of the scan conveyor. In addition, Prodrive integrated additional illumination to ensure optimal image quality and read performance. The ultra-compact MS-2D imaging engines are integrated into an XY positioner inside the scan conveyors at Prodrive. Thanks to the DPM barcode reading solution on the scan conveyor, Prodrive can make sure that all barcodes are readable and marked correctly, and that any issues are addressed immediately. “While more and more processes are automated, full supply chain traceability of each component is increasingly important. We have been able to develop an innovative solution together with Microscan, which increases the flexibility and quality of our production process, while ensuring traceability at each step of the production process and beyond,” said Sam de Bruijn. “The scan conveyor is a great example of our in-house design and development capabilities, and we are continuously looking for ways to improve our manufacturing processes,” De Bruijn continues. “We are currently developing our own next generation Automated Guided Vehicle (AGV) which will be used to take care of our internal transport of components and finished products. This product offers a flexible and reliable way to automate internal transport with a very interesting return on investment. Prodrive has been happy with Microscan’s products and service, and we would be happy to include them in relevant project evaluations in the future,” De Bruijn concludes. The MS-2D engine provides the best performance available for reading 1D/2D symbols and direct part marks at very close range.